Last summer, just before he went into Saratoga Hospital to have a hip repaired, Dr. Leo Hoge, local racing historian and former medical practitioner, recounted his memories of Secretariat to library assistant Victoria Garza. Hoge and Garza met by chance beneath the colorful WPA frescoes that decorate the main entrance to the Post Office. Hoge’s story pretty much says all there is about the Gr.1 Hopeful Stakes. Trainers and owners tend to become starry-eyed with horses that win it. Trainer Rick Dutrow, Jr. has called this year’s winner, Jay Em Ess Stable’s Boys At Tosconova, a star in the making. Every jockey to sit on the back of the well-built colt with the near black coat has agreed. Monday’s Hopeful did nothing to temper the praise. Boys At Tosconova beat three horses handily. A son of Officer from a Coronado’s Quest mare, there may be cause for concern that he can’t get a distance. Yet, it would take a whole lot of imagination, at this stage of summer, to cite a two-year-old horse of greater promise. It took 39 days and two races for Ed Abramowitz, the “Jello shot” man in the backyard, to see that speed was supreme. Then he and his sidekick Larry Benton watched as several horses won from off the lead. Awakino Cat almost broke the track record in the fourth race, the Frank Sullivan Stakes. Affirmatif and Ravalo ran so fast in the first half of the 5-1/2 furlong turf sprint that jockey Alan Garcia was able to make his mount’s late surge pay off. After Rogue Romance won the sixth race for trainer Ken McPeek, the awards for the meet’s top jockey, trainer and owner were presented. Although jockey John R. Velazquez received the loudest praise, the crowd of 25, 298 saved its most heartfelt emotion for “The Chief” as he presented the first-ever H. Allen Jerkens Award to top trainer Todd Pletcher. Everyone will have his opinion about which was the race of the year, but many of the daily faithful pegged the eighth, a 1-1/16 mile turf race for New York-bred fillies and mares. The video camera caught Frivolous Buck a nose hair in front of Gitchee Goomie, who finished a nose hair ahead of Tutti Vu Bene. Two races later, Keertana won the Gr.3 Glens Falls Handicap. Anyone who devoted his Labor Day holiday to coming out was given free admission. The backyard was a kiddie’s park, the apron a sea of people. The weather was the same it has been through most of the meet - sunny and clear, only chillier. You could tell that fall was approaching. A few neighbors from the “Doc Blocks” of Fifth Avenue brought the season to a close like a family, drinking Scotch, eating steak and arguing. It was a fitting way for people engaged in the love of the sport to kiss goodbye to each other and the 40-day haul. That was it for another Saratoga. 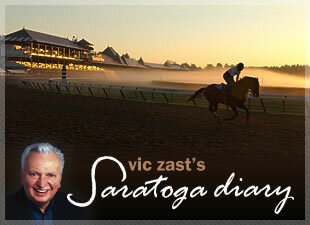 Vic Zast has now concluded 47 straight summers in which he’s attended the races at Saratoga.